You and your best friends can buy the house together. CHILDHOOD DREAMS FULFILLED. There are few things more iconic than a beloved TV house. Some television homes just tend to stick with you. For example, I think we all remember the iconic house from Drake and Josh. For four seasons, fans knew this as the exterior of Drake and Josh's family home. Of course, the show's interior scenes were really shot on a soundstage elsewhere. 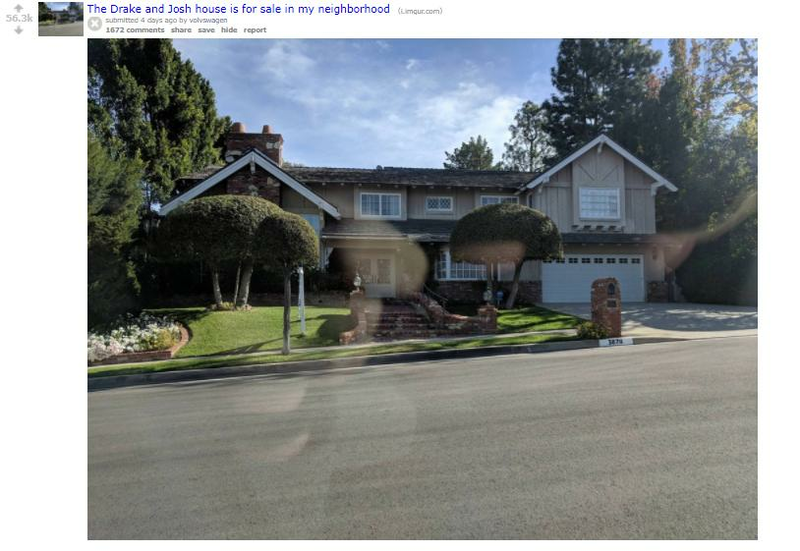 One reddit user posted the house that once served as the show's exterior setting and informed us of the best news EVER. The Drake and Josh house is officially for sale and it's literally your childhood dream come true. Even the trees are the same more than ten years later! The five-bedroom Encino, Californa home is currently on the market for $1.8 million, which means you and your friends need to seriously pool your cash to be able to secure the iconic property. When the internet found out the Drake & Josh house was up for sale, everyone pretty much wanted it IMMEDIATELY. Does anybody have $1.8 million that i could cop to buy the drake and josh house? However, everyone had one thing on their mind and it's definitely a headscratcher. Why DID Drake and Josh have to share a room if there were five bedrooms in the house? Presumably, their parents would share a room, then Megan would get her own, and Drake and Josh could have separate bedrooms, right? Even Josh wondered why he and Drake had to share a room in a house with SO MANY ROOMS. It's settled. You and four of your closest friends go in on the Drake and Josh house and remodel the insides so it matches the show's interior. Flawless plan, right? If anyone wants to go in with me, I've got dibs on the attic room. Listen to the #PopBuzzPodcast with John Cena right here or subscribe for free on iTunes to get new episodes sent straight to your phone every Friday.